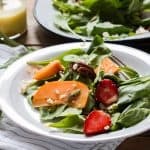 This Greens, Persimmon Ricotta Salad with Bitter Orange Marmalade Dressing is a true blue winter salad and a great way to celebrate the beautiful produce! To make the salad dressing, place everything in a food processor or blender and blend till combined. The dressing will emulsify and become thicker. Toss everything in two to three tablespoons of the salad dressing. Reserve the extra dressing in an airtight container and refrigerate for up to a week. Note 1: If you don’t have bitter orange marmalade, substitute with 3 tablespoons orange juice and a tablespoon of honey. Reduce the vinegar to 1 tablespoon in this case.